After three days in Cuba, Pope Francis touched down at Andrews Air Force Base in Washington, DC, in the United States of America, greeted by the president, dignitaries, bishops and children. 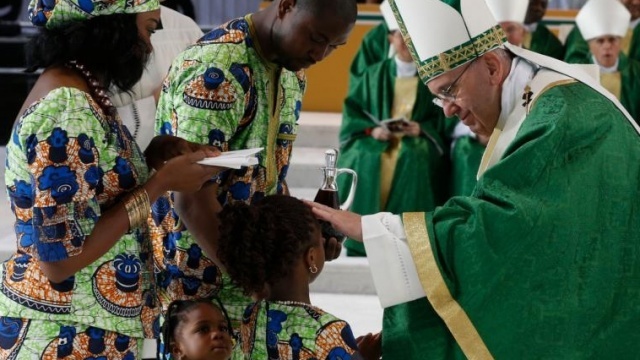 This is the 10th papal visit to the country since 50 years ago. 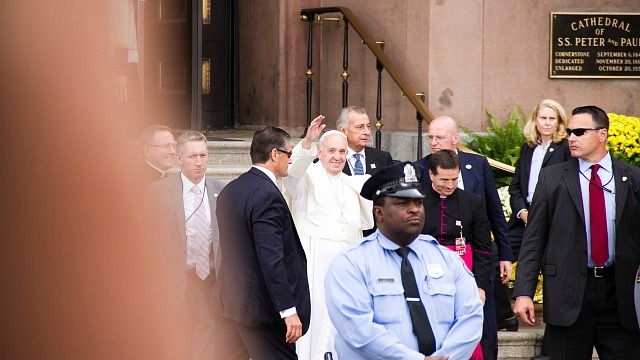 Each of John Paul II, Benedict XVI, and now Francis, has paid a visit to the American capital once. 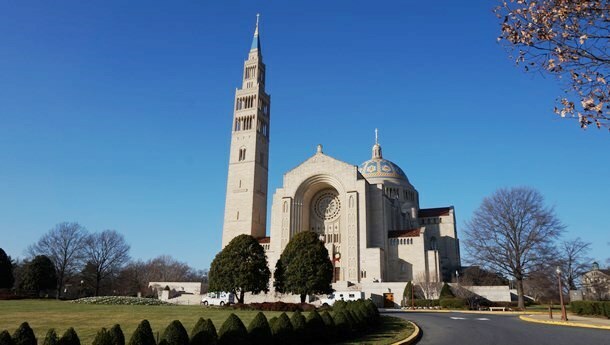 Washington is called the Little Rome because you can find many Catholic institutions in the city: from the national Catholic university founded by the American bishops and the pope, to countless houses of various religious orders, Catholic hospitals, seminaries, and impressive churches. 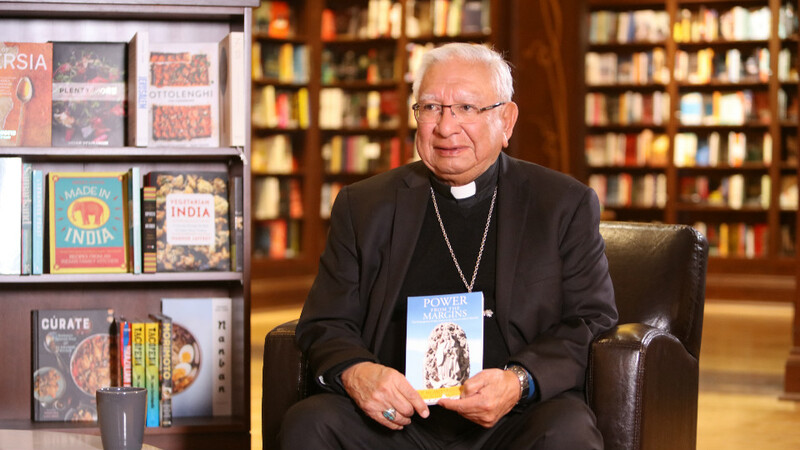 Washington is the only city in the Americas which can boast of three resident archbishops: the Archbishop of Washington, the Archbishop Military Ordinary, and the Apostolic Nuncio to the United States. It is also home to the headquarters of USCCB, the official assembly of all bishops in the country. The Basilica of the National Shrine of the Immaculate Conception of the Blessed Virgin Mary, or simply called the “Shrine” by locals, was built to commemorate the national patron saint. America’s first bishop, John Carroll, consecrated the newly created country to the Blessed Mother under the title of the Immaculate Conception in 1792, even though the dogma of the Immaculate Conception would only be proclaimed by Pius IX later in 1854. Construction of the shrine lasted for decades, from its groundbreaking in 1920, through its dedication in 1959, to its completion in 1961. Located in the campus of the Catholic University of America, the shrine is the largest Catholic church north of Mexico, although shy of the size of the Washington National Cathedral and the Episcopal Cathedral of St. John the Divine in New York City. With a mix of neo-Romanesque and neo-Byzantine in style, the superstructure is home to more than 70 chapels dedicated to different titles of the Blessed Virgin Mary, located on the sides of the upper church and in the crypt. 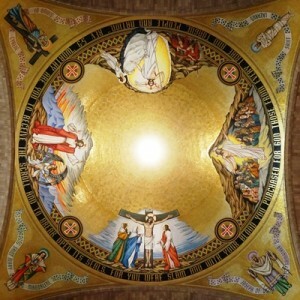 Beautiful mosaics are found everywhere, from the 15 mysteries of the Rosary in the apses of the crypt, to the 3 impressive domes in the upper church. Do not miss the exhibits of the stole used by Pope St. John XXIII to convoke Vatican II and the last papal tiara that Pope Blessed Paul VI gave away for the poor. The basilica is a must-see church for Catholics in North America. Pope Francis will visit the basilica in the afternoon of 23 September 2015, and hold an outdoor mass, canonizing Junípero Serra. 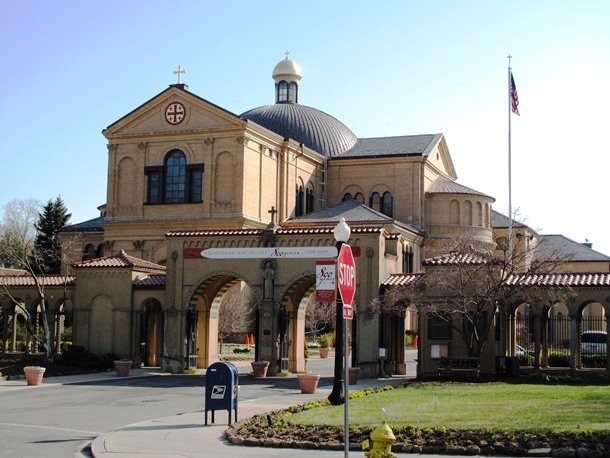 Although not as famous as the “Shrine”, the Franciscan Monastery of the Holy Land in America in the same city is often overlooked as a treasure. It is equally spectacular in terms of popular devotions but differs in theme. It is a miniature version of the Holy Land. The church contains replicas of the holy sites in the Holy Land and elsewhere, including the Grotto of Annunciation, the Bethlehem Grotto, the Altar of the Magi, the Chapel of the Transfiguration, the Holy Sepulchre, the Catacombs, to name only a few. Those who have been to the Holy Land will relive their blessed moments, and those who have not will experience such. You can find even more replicas outdoors: the Grotto of Gethsemane, the Ascension Chapel, the Tomb of Mary, the Portiuncula, Lourdes Grotto and a cloister with Our Lord’s Prayer and Hail Prayer written in dozens of languages. 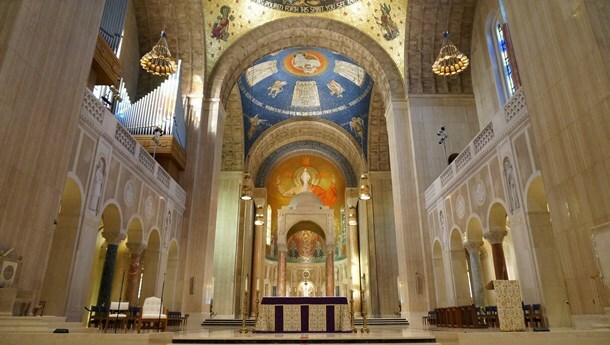 Catholics who visit Washington DC should not miss the monastery. St. Matthew the Apostle was a tax collector before he followed Jesus. He is aptly considered as the patron saint of civil servants. The parish church in the heart of the American capital was established in 1840 and was dedicated to the apostle to serve the civil servants. 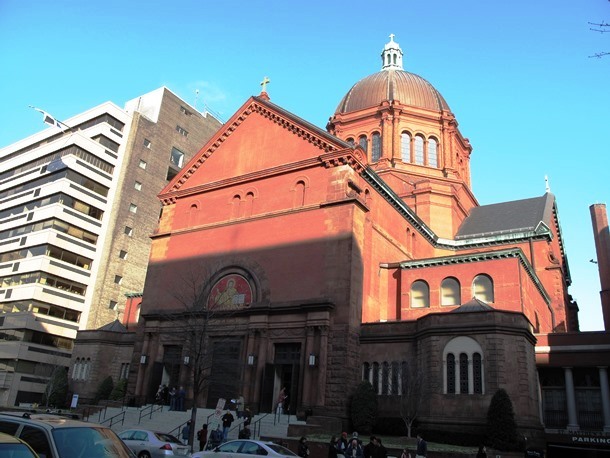 Although the Archdiocese of Washington was only created in 1947, this church had gained the cathedral status in 1939. The state funeral of John F. Kennedy, the only Catholic American president, was held in the Cathedral of St. Matthew. Pope Francis will be here on the morning of 23 September to pray and meet with the bishops. 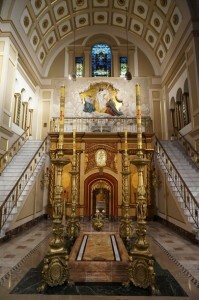 St. John Paul II National Shrine, opened in 2014 on the same day of the canonization of the pope, was converted from the former John Paul II Cultural Center by the Knights of Columbus. It is a place of prayer as well as an exhibit of the legacy of the great pope. 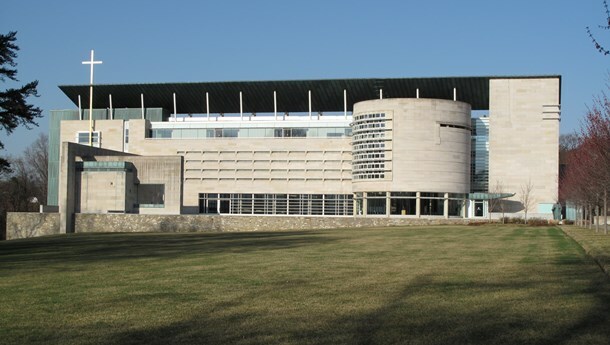 It has an impressive permanent exhibition hall showcasing the different time intervals of the life of John Paul II. Mass and confessions are held daily. 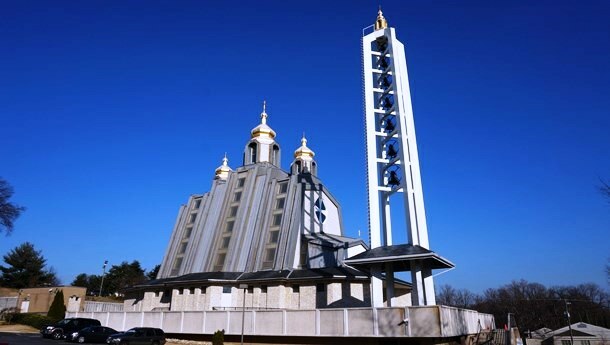 For Roman Catholics, the Ukrainian National Shrine of the Holy Family in Washington, DC, gives a different taste through its architecture, liturgy and tradition. The Ukrainian Catholic Church is one of the 23 sui juris Eastern Catholic Churches in communion with Rome, and the most populous in the world. The cornerstone of the shrine was blessed by John Paul II in 1979, and the upper church was completed in 1999. During the celebration of the World Meeting of Families and the 14th Ordinary General Assembly of the Synod of Bishops, the national shrine is a good place to pray for our families with the Holy Family as our model. Follow live coverage of Pope Francis' visit to Washington, and later to New York City and Philadelphia on your favourite Salt+Light Television. For readers in Canada, do not forget that you can watch Salt+Light Television free of charge through their cable or satellite during the months of September to November this year.